The sack or robe à la francaise had loose pleats at the back of the neck and an open front. It was a style that dominated women’s fashions during the 18th century. It developed from a loose negligee but by the 1770s it had become a more formal type of dress and would have been worn for attending assembly rooms, dinner parties, the theatre or the opera. 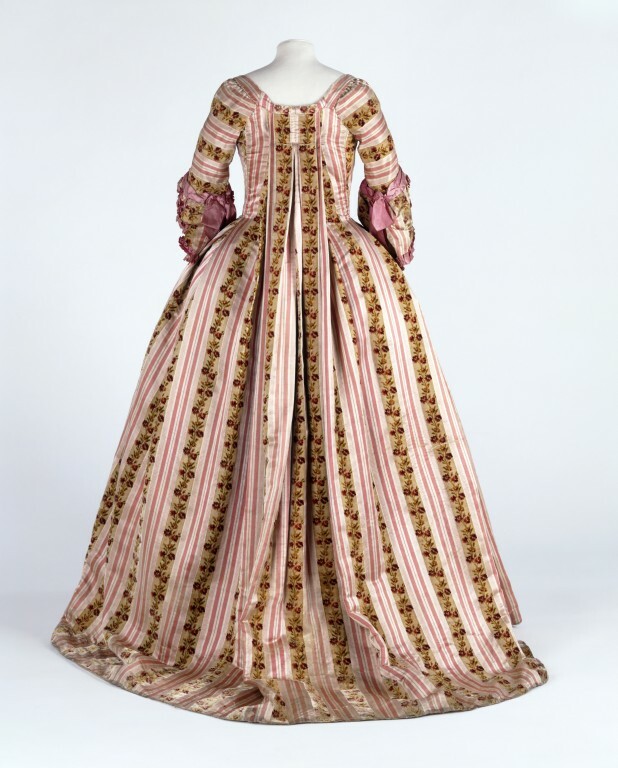 This is a very rare example of the use of velvet in 18th-century women’s dress. Normally fabrics are printed after the weaving process. In the chiné technique, the warp threads are printed before, and during weaving the slight pulling of the threads gives the pattern a blurred effect, resembling a watercolour when finished. In this extraordinary example, the chiné process has been combined with velvet - a difficult technique that was produced only in a few places in France. The silk for this fabric is reputed to have cost 36 shillings a yard. 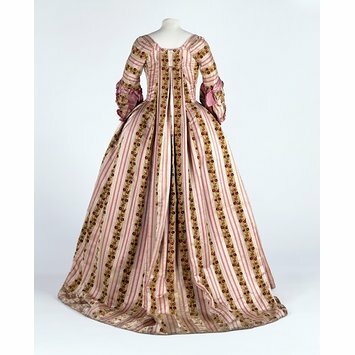 With an average of 17 yards required for a sack and petticoat of this style, the fabric would today cost about £2,200. A woman's sack and petticoat of silk chiné velvet. The fabric is woven in alternating bands of ivory and pink satin in a vertical ribbon pattern with a band of floral chiné velvet. The sack is open at the front with elbow-length sleeves with single, scalloped sleeve ruffles. The bodice meets at the centre front. The sleeves are lined with linen; the bodice with white silk taffeta, open at the back. The sack has two, double box pleats at the back, extending from shoulder to hem. At the front, the skirts are pleated into the waistseam. The sack is made of 3 widths of silk at the back and sides. The front skirts are each made of one partial panel of silk and 2 triangular gores, to shape over a fan-shaped hoop. The hem is faced with a deep band of white silk taffeta. The petticoat is made of four widths of silk pleated at the waist. The sack and petticoat were altered in the late 19th century for fancy dress. The binding of the petticoat waist was removed and adjusted to lengthen the petticoat. The seams of the sack side gores were restitched to alter the shape of the skirts. The waistseam at the fronts was unpicked and resewn. A strip of whalebone was added either side of the lining opening at the back of the bodice. Hooks and thread bars were added to the bodice fronts. The sleeve ruffles were removed to shorten the sleeves, then re-sewn and pink silk ribbon bows added to cover them. A narrower gathered ribbon was sewn to the right bodice front and lower edge of the left front. Formerly part of the Castle Howard Costume collection, the private collection of George Howard. Purchased on 7 October 2003 from the Sotheby's. This is a very rare example of a velvet used in 18th century women's dress. This particular combination of the chiné technique with a silk pile is unusual. It was a difficult technique and only produced in a few places in France. The silk for this fabric is reputed to have cost 36 shillings a yard.